Our generic replacement for the American Ultraviolet GML080 Replacement UVC Light Bulb emits short wave UV-C radiation with UV output peak of 253.7nm. This wavelength region is considered as maximum germicidal effectiveness and is highly fatal to microorganisms such as bacteria, virus, protozoa and other pathogens. The genetic material of the microorganism is deactivated when germicidal UV light passes through them and makes them incapable of multiplying. Researchers are of the opinion that this method of sterilizing water is a purely physical process. It does not affect the chemistry, pH or taste of water in the process and is a much better option to chemicals and their by-products. 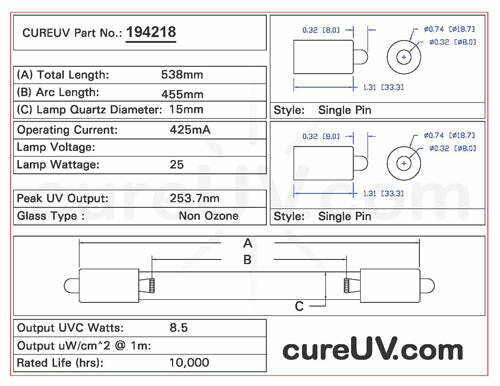 CureUV.com’s UVC bulb measures 21.18 inches in length and can last for up to 10,000 hours, after which we recommend replacement for maximum effectiveness. The 25 Watt germicidal air, surface and water treatment bulb is a single pin double ended bulb is well-suited for applications that require UV-C intensity.